The ultimate goal of guides, theorycrafting, and easily accessible cookie cutter builds are to help people play better. Just like baseball isn’t very fun if your outfielders can’t catch… raiding isn’t very fun if your DPS can’t kill stuff. While there are a lot of guides and blog posts out there teaching people how to do good damage, what we explored last week was one major, unintended side effect of the predominant “style” of presenting One And Only One Way of doing things. The problem? It unnecessarily discourages player customization. We saw that simply giving people a little data as context can drastically reduce this side effect without compromising the main goal. When given data, people are far more likely to actually help their fellow players who are underperforming (as opposed to criticizing them and leaving it at that). When given data, the amount of negativity and toxicity reduced dramatically. Recall the question and graph below from our cookie cutter builds article. It shows whether people thought it was acceptable for the Fury Warrior to keep using Furious Strikes, based on the statement they saw. People were randomly shown one of three statements: a data statement, a guide statement, and a top player statement (shown in orange text below). Fun: Players should play what they find most fun. Skill: Likely skill is a bigger factor in DPS than talent choice. This category included both yes and no responses, which can be confusing. When people said ‘no,’ they cited skill was a large issue, but that the talent should also be switched. Balance: The talents are balanced, so play what you like. A note: while this implies that skill is likely the cause of the low DPS, this group did not actually say it, so it’s a separate category. 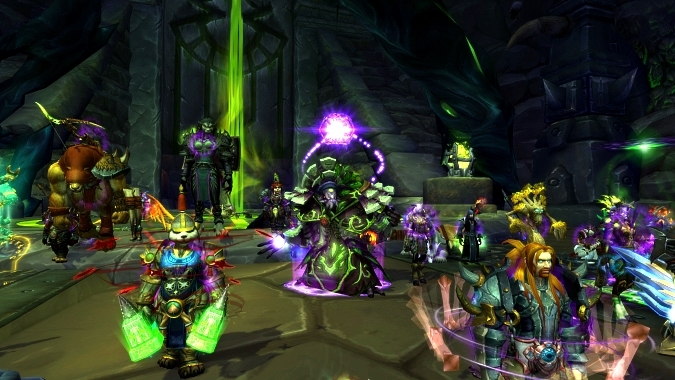 Team: Players need to do what’s best for the raid team, regardless of fun. Logic: Respondents offered a technical explanation as to why one talent was better than the other. This group harbors nearly all of the negative attitudes. The attitudes here are the sort that make people feel stupid for “not understanding simple game mechanics,” or just feel bullied. We’ve all been there; we’ve all seen it. A player isn’t performing where they should be, someone suggests a change, and the bandwagon jumps on — usually not in a positive way. Am I suggesting people should play anything they want, anyway they want, regardless of how well they perform? No. Raiding is a team sport, after all. But I do believe people are unnecessarily harsh. Unnecessary is the key word here — the whole premise of these articles is that most aspects of character customization (talents, gear, et.) are really well balanced. 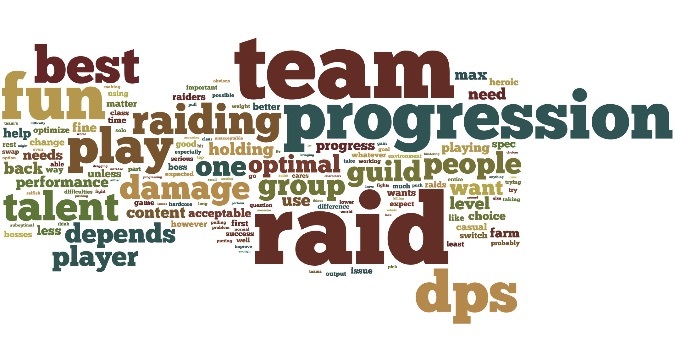 When abilities are balanced, bullying someone into changing a talent that is roughly 1% different isn’t going to make or break the raid. Let’s look at the results for the “Why?” question. I dissected this data across different groups: people who played Warriors (or not), raid leaders (and members), and people who progressed through various raid difficulties. The results are very similar across all groups, believe it or not! When I saw how large the team categories were for the Guide and Top Player statements, I went back and checked the data three times. I couldn’t believe how many people were this angry at the Fury Warrior. But look at what happens to the team responses when shown the data statement. It drops from about 40% of responses to 10%. And since 3/4ths of the team statements are rude, that shrinks the toxic group from about 30% to 7.5%. I don’t know about you, but I’d love to be able to decrease the ratio from 1 in 4 people being toxic to 1 in 13! After reflecting on this a bit more, I realized that most of the team people didn’t intend to be rude. In fact, they perceived the Fury Warrior to be the rude person rather than themselves because he wasn’t taking the team into account. And for a team sport, that is a fair point of view. This group is acting on the information given to them, just like they do in game, which comes from guides, forum posts, tools, and so on. One of the reasons I believe this group isn’t made up of inconsiderate jerks is the drastic attitude shift when looking at the team responses to the data statement. Showing people that the talents are balanced redirects their assessments to more constructive areas. This is where the skill category shows up. When shown the data statement, people are very likely to suggest that skill might be the issue rather than the talent. Responses suggest looking at logs, finding out how many actions per minute they are using, seeing if they understand specific mechanics, and so on. Basically, these people suggest working with the person to help them improve, rather than just telling them to change a talent and walking away. Next, let’s look at the logic category. 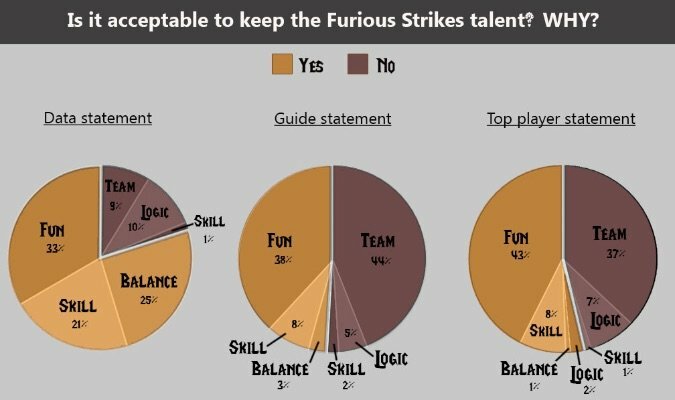 When shown the guide and top player statements, the logic group responded with some level of detail about why Sudden Death (the popular must-have choice) should be chosen over Furious Strikes. So does this hurt our entire conclusion? Is showing more data sometimes a bad thing if it elicits terrible responses like this one? The problem is not that we showed data to this group of people. The problem is that these people were so sure that they were right, that they immediately and angrily discounted any data to the contrary. This is a side effect of every guide out there not showing data to these people, so it amplifies their beliefs to such a level that responses like the one above become the norm. You can imagine a raider using a simulation or logs to support their choice, only to be similarly shut down. And lastly, the fun category! If you look at the graph, you’ll see that a stable 30% of players prioritize fun above all else, regardless of the statement they saw. Neither I nor most of the respondents were saying that having fun means disregarding your fellow teammates’ goals of boss killing. People don’t play this game hoping to be bad and it’s fair to say we all want to excel at our roles. We just need to direct efforts toward helping players instead of demanding changes that probably won’t do anything other than make everyone short-fused and angry. How we, as a theorycrafting community, present advice that influences people’s behavior towards other players. Absolutist advice not only promotes a negative attitude, it’s counterproductive to the goal of improving play. Of course, none of us mean to cause these negative side effects, quite the contrary… we’re here to help our fellow players. I’m not blaming or criticizing any of us. The work each of us does is incredible. I am saying we have an interesting opportunity for improvement. By showing data behind our findings and providing context we can (hopefully) dramatically change behaviors. Players all know, deep down, that spell usages and skill is likely what causes low DPS. But in day-to-day interactions with raid members, it’s easy to forget that and blame low performance on things that don’t really matter. Providing context with our advice directs people towards actually helping the player improve. I know this is easier said than done, but I think it’s important we all try. And Legion is a good place to start. Next I’ll be writing part three of this series, covering other people’s responses to this topic. Some may agree, some may not, others might elaborate on a sub-point I made, or see something new in the data I presented. I’ve already read a lot of good posts from Delirium, SunnierBrew, Magdalena, Talarian, Rohan, Thuggs, and Ben Marble. Blizzard also used it as a topic of the day. So keep the discussion going, tweet your articles to @AskMrRobot or @Zoopercat, and I’ll see you soon!